Time Fantasy Add-on: Animals| RPG Maker | Create Your Own Game! This expansion pack includes 48 animal sprites. Every animal you need for a farm: cows, pigs, chickens, goats and sheep, with babies and adults. 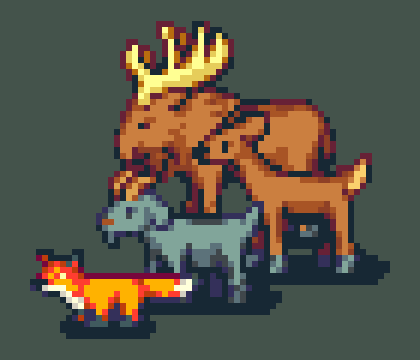 Forest animals such as deer and bears, with squirrels, rabbits and other small creatures to populate your world. Birds of different kinds can take to the sky! 48 new sprites that expand on the Time Fantasy style. Farm animals and forest animals, including flying birds. 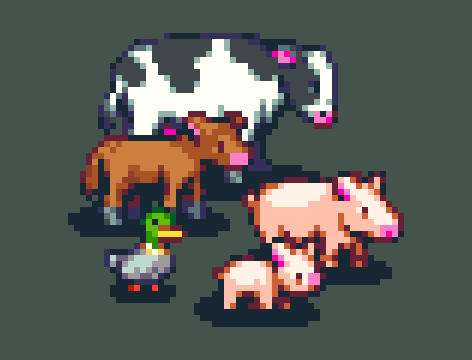 Cows, bulls, pigs, sheep, chickens, ducks, deers, and bears as adult forms and babies. All animals have full four-direction walking animations. Bonus: Includes 16 animal sprites that have been previously released (dogs, cats, and horses! ).